Evolis Tattoo Rewrite card printer with contactless smart card encoding, USB infterface and 2 year warranty. 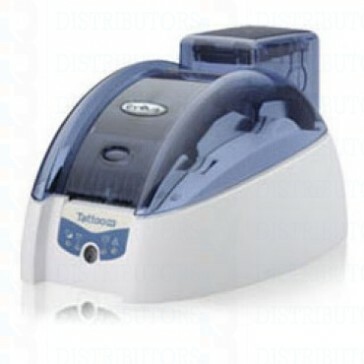 The Evolis Tatto Rewrite (TTR201BBH-00CW) card printer with contactless smart card encoding. The Evolis Tattoo was created specifically for monochrome and Rewrite card printing. Great for printing text and barcodes over pre-printed cards and creating low cost monochrome cards. With its compact footprint and user-friendly operation, the Tattoo Rewrite allows you to erase and print the same card up to 500 times.The 300 dpi standard resolution and the large print area provide unrivalled freedom when designing cards. Enhance your cards with more texts and graphics (logos, barcodes). It's compact and sleek design makes it the ideal equipment to integrate and use in multiple environments: offices, reception desks, points of sale, etc. With the Tattoo Rewrite, you can generate or update loyalty cards, visitor badges or membership cards within seconds. Data can be edited on the spot and the same card can be reprinted or reused up to 500 times.The Tattoo Rewrite will help you save significant money since no ribbon is requiredand cards are reused, which makes it an environmentally sound solution as well.